There is more than one way to straighten your teeth — and it doesn't have to take years! If you qualify, Dr. Briscoe may be able to transform your crooked smile by using Instant Orthodontics: dental porcelain veneers that bond to the surface of your teeth. Dental porcelain veneers are very thin, custom-made, tooth-shaped pieces of porcelain that are bonded to the front and biting edges of teeth to create a beautiful, natural smile. Dr. Charles Briscoe has been crafting and placing porcelain veneers for more than 30 years, and with his advanced training in cosmetic procedures is considered a leading La Jolla cosmetic dentist. By carefully crafting veneers, he can custom-design a method to give your teeth a straight, even appearance. In just one short week, Dr. Briscoe can give you a smile that is straight, white and perfectly fitted to your facial features. A successful attorney came to La Jolla Dental Care who had considered improving her smile with traditional orthodontics (braces for several years) or with Instant Orthodontics utilizing porcelain laminate veneers. 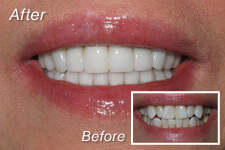 After much deliberation, we placed ten veneers on the top front teeth and ten veneers on the lower front teeth. Dr. Briscoe was able to shape each tooth appropriately to receive the porcelain restoration that would fit into the alignment of the other veneers. End result, the patient attained a nice, straight appearing smile with proper function, healthy gums, and permanently white teeth in a period of several weeks. A young entrepreneur came to La Jolla Dental Care desiring to align his teeth, straighten his smile, and attain a whiter, brighter appearance. Through the technique of Instant Orthodontics, Dr. Briscoe was able to align his bite, create a pleasing smile with white, bright all-porcelain restorations. This full mouth restoration case was accomplished in a period of two months. How do you know if Instant Orthodontics is right for you? In a Consultation, Dr. Briscoe will help you decide if Instant Orthodontics should be part of your Smile Makeover. The best way to find out if you are a candidate for Instant Orthodontics is to schedule a consultation with Dr. Briscoe at his La Jolla dental spa. In a consultation, you can ask all of your questions, and find out if Instant Orthodontics is right for you.